Our Self Guided Bike Tours in Portugal have routes on quiet paved roads that pass through vineyards, cork forests and ancient castles. Portugal is the perfect destination for a self guided bike tour all year long. Located near Spain & Morocco, and bordered by the Atlantic Ocean, see Lisbon, Porto, the Alentejo region, and much more! Tour Dates: Year-round 2019 Price: €1150-1550 Euros pp double occupancy Single Supplement: €300-600 Euros The Portugal Self Guided Bike Tour follows uncrowded paved roads that pass by castles, fields of cork trees, and the land of ancient battles. Portugal Self Guided Bike Tour in the Alentejo are the perfect blend of natural beauty, medieval villages, tasty cuisine, and excellent wine. 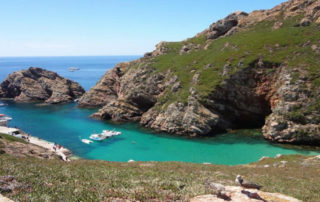 Tour Dates: Year around 2019 Price: €1370 Single Supplement: €350 Euros Our Portugal Bike Tour route takes us through stunning coastal scenery, typical fisherman’s villages and UNESCO World Heritage sites. You will pass by Nazaré, a legendary surf spot where the professional big wave surfer Garret McNamara set a world record riding a 100 foot wave in 2013.